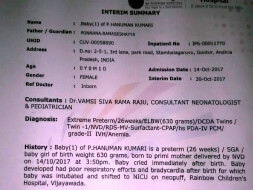 I am trying to raise funds for the treatment of a school teacher's just born baby. 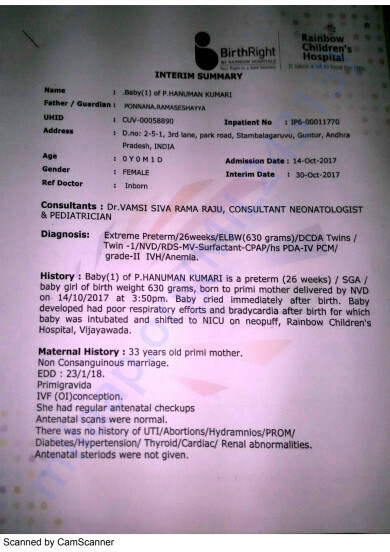 She was born premature and had poor respiratory efforts. She was diagnosed with bradycardia and is currently in NICU on neopuff. 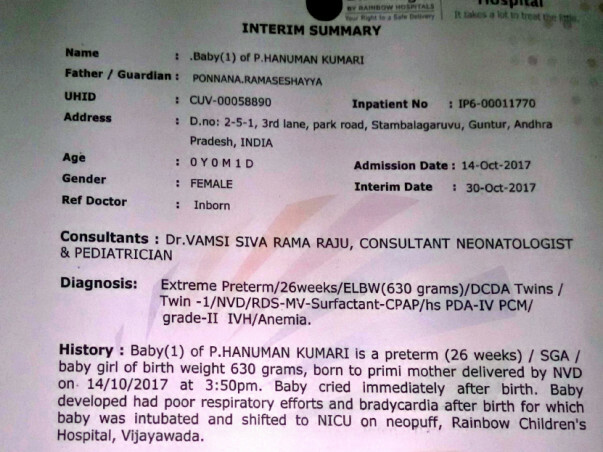 The doctor said that the baby needs to be in NICU for at least 4 more weeks with the total hospitalization cost coming close to 15 lakhs. My teacher has used up whatever savings he had and whatever he could quickly borrow. We are still short of funds amounting to 8 lakhs. It would help a beautiful baby girl born to a middle class school teacher live if we can raise the amount in 1-2 weeks. I am providing the contact of the Doctor who is looking into the case and the mother of the baby. Thanks a lot for helping the baby. The baby is still in neo-natal ICU but the condition is much better. We will be using the funds you contributed to pay the hospital bills and I will be adding the doctor diagnosis once again. Once again thank you all for your contribution.